Not sure how I missed this in March but bodybuilding and fitness has lost one of it's most inspirational figures, Larry Scott. Born in Pocatello, Idaho in 1938, Scott was bodybuilding's first Mr. Olympia, the prestigious title that was later won by the likes of Arnold Schwarzenegger, Frank Zane and Franco Columbu. 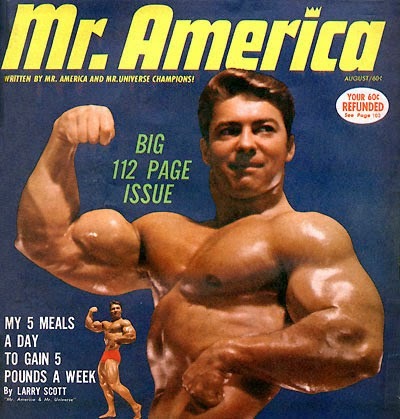 Possessing a clean cut, All-American handsomeness and some of the best arms and shoulders in the game, Scott was the premiere bodybuilder of the early 1960's. After winning the Olympia title a 2nd time in 1966 at the young age of 28, Scott abruptly retired to focus on his personal life. A devout Mormon, Scott had set up shop in Salt Lake City, Utah where he ran gyms, spas and supplement stores. He died at age 75 of complications from Alzheimer's disease. He is survived by his wife of more than 40 years and their 3 remaining children. Scott had one of the great physiques of all time as he was massive yet not lumbering with huge cannonball delts and a narrow waist. His arms were always center of attention with their dense, football shape but his thick, V-shaped back, wide, slab like chest, statuesque thighs and calves were always up to snuff. Working with Vince Gironda and Rheo H. Blair, Scott became one of the first bodybuilders known for attributing as much success to nutrition as training. Scott is said to have taken in 2 cups of Blair's special protein a day with heavy cream and a gallon of milk a day, that's 16 cups of milk! Back then a breakfast would consist of hamburger patties, whole eggs and cottage cheese. High protein and fat with low carbs and few vegetables were the norm. 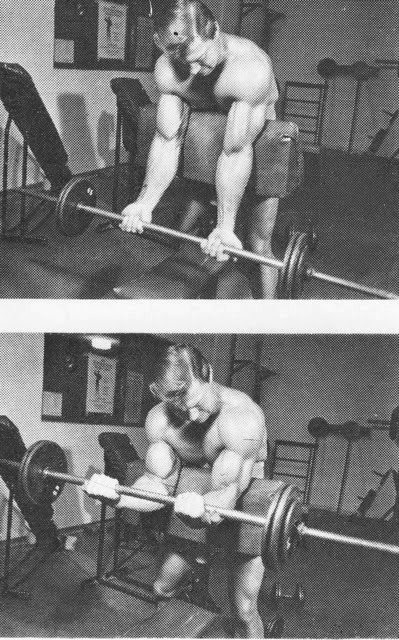 Larry Scott loved preacher curls, so much that people started to dub them "Scott" curls. Using the angled bench or the reverse flat "spider" side helps take the deltoids out of the equation and helps pump up the brachialis, the rope like muscle between the biceps and triceps on the side of your arm. Preacher curls also help tie in the lower bicep near the interior elbow joint to give your arms a fuller, thicker appearance. Remember, some of us have a low tie in while others have a high tie in. A low tie in usually means longer, thicker biceps with less peak while a high tie in has more space between the bicep and inner elbow for a bigger peak. Fry your Deltoids: Sit on a bench with dumbbells in hand, raise them laterally until they are over your head and nearly touch. Do 4 reps here. Without resting, raise the DB's out to the side but stop at ear level then bring them together in front, return them to the side and lower. 4 reps here. Still without setting them down, burn out and do regular side raises until you feel like your shoulders are ready to fall off. That's the Larry Scott way! Build a better Bicep: 2 Arm Preacher Curl w/Dumbbells, with your shoulders wide and your elbows on the bench tight, lower the DB's all the way to the bottom then curl up, flexing at the top. After 6-8 reps, Scott would perform 3-4 half reps or "burns" to really tear the fibers. Regular Preacher Curls were next with full reps and more burns. Reverse curls, either standing or on the Preacher bench were next to fry the forearms and brachialis. Scott would usually select 4 exercises per body part and complete 5 sets which is a bit much for us non-competitive types. I usually aim for 3 sets of 3 different exercises per body part, working at least 2 a day like Chest/Biceps, Back/Triceps, Shoulders/Legs, etc. My condolences to the Scott family and much respect to one of the early prototypes. Train In Peace.